Lets put some facts down first. Currently Skoda in Australia are vehicles released from the same production line as VW. The Skoda range of vehicles are low cost options of the VW. Nick named the poverty pack of Volkswagens. What the critics have not told you is how this car manufacturer has taken the country by storm and why they seem to be so popular. Whilst the VW is mechanically a diabolical brand after the diesel scandal, the turbo charged four cylinder engines that seem to fail as frequently as not, and the disastrous DSG transmission issues from a few years ago, they have some how survived these and consumers are still flocking to the VW. The modern Volkswagen in the market is competing with the luxury car makers. Getting into the ring with Audi, Mercedes Benz, Lexus and BMW was always going to be a fight that left someone with a black eye and bloody nose. VW was the loser from these contests however when Skoda came along the people in high paid jobs got clever and entered the Skoda into the affordable family car class and the Skoda came out looking not so bad. 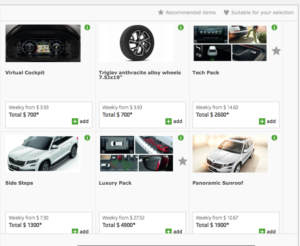 Skoda cleverly priced the vehicles at a very cheap entry level product with almost no options. A basic model car could be purchased for just say of $17K and you can drive the finest engineering to come out of Germany for $17K, however the car comes with very few options. For many users this hardly matters and they can have an exceptional driving experience with a relatively low cost. This is how Skoda took on the car market. A European made and engineered car, with relatively good styling, limited features is now very affordable. What if you want the features? Fear not. The good people of Skoda have created this very fun, funky interactive car builder on the website. Dubbed the 3D configurator, you can build your dream Skoda with all, none or some of the features available. You can add all the features that BMW or Audi have. You can add metallic paint, mag wheels, GPS, cruise control, a glass roof and a boot that opens with your foot. Now take the same base model car that cost you $17K and add all the features and its around $30k for the same car. Depending on the features you select you drive away price can be anywhere in-between. Very clever of Skoda, allowing their vehicles to cater to almost every one in the new car market. All in in, if your going for the cheaper options with less features, value for money you can’t really go past Skoda. The manufacturer also offers a five year warranty on it when current legislation only requires three. This is the sign of a company willing to back their product. Mechanically they Skoda is not amazing with some issues presenting as common and especially if compared to the european counterparts such as Audi and BMW the Skoda is found wanting. However thats not really comparing apples with apples, the true comparison is when placed against other entry level vehicles coming out of Europe. Things such as opel which is currently all the Holden range of vehicles. Id drive a Skoda over an Opel every day of the week and twice on Sundays. Value for Money the Skoda Range is not half bad.